04.29.2010: San Francisco rocked by the Kaijucast! April's target for the Kaijucast spotlight, August Ragone, sat down to talk to me about Eiji Tsuburaya's classic Japanese Science Fiction show, Ultra Q.
Ok, so I didn’t really rock San Francisco – just the Moscone Center, where Wondercon is held. Wondercon was really a fantastic convention and I was very psyched to have the opportunity to head down to the show. Aside from geeking out about comics and artists and everything else that was happening at the show (*cough*cough*doctor who premiere) I was able to see a couple of my local friends, meet new people and record the interview for this episode of the Kaijucast. That episode, number sixteen by the way, is available for download right here. 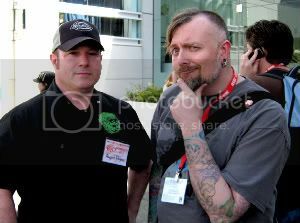 The person who I hooked up with or this interview was none other than August Ragone, a long time friend of mine who took the time to talk specifically about a television show from the mid-1960s in Japan called, Ultra Q. If you’ve never seen Ultra Q or have always been curious, this is the episode for you to listen to. The series is such an important keystone for not only Kaiju films, but also for most everything you all love that comes out of Japan. August and I sat down in a coffee shop outside of the convention center so there’s going to be some background noise, but I’ll tell you… finding a place near that convention that wasn’t filled with ambient audio was nigh impossible! Regardless, we talked for quite a while about Eiji Tsuburaya’s breakthrough television show, and it came out really well (if I don’t say so myself). Additionally, this last month’s assignments have been turned in and after a musical interlude, we delve into the heart of the beast known as Hedorah, the Smog Monster! If you missed out on this month’s Daikaiju Discussion homework, fear not! There’s always next month’s episode… I could go on and on here, but you probably want to know what music I played in this episode, right? Let get our tails to the track listing, then! Varan’s leading lady gets some attention. Death Kappa – you need to see this! 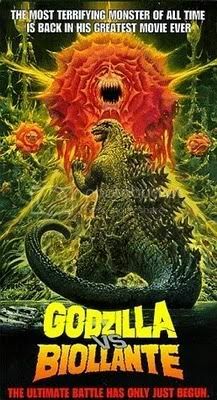 I know this is going to be slightly problematic, but your fifth homework assignment is to watch the second film in the Heisei series, Godzilla vs. Biollante from 1989. Now, I do realize this is could be an issue for many listeners since Godzilla vs. Biollante is one of the only films without a legitimate DVD release, but do me a favor… check through your closets, your friends’ closets and maybe even your local library to see if you can find the old VHS version of this movie from HBO. I will be screening this at the Anime Oasis convention next month in Boise, Idaho. So if you are anywhere near Boise on Saturday, May 28th, you need to make out to the Show in order to see this movie. I can’t tell you if it will be subtitled or dubbed, but it’s a pretty shockingly killer treat that this movie is available to show. I don’t expect anyone to buy this movie just so they can take part, but if you do, you get major radioactive brownie points with me. You can download the sixteenth episode of the Kaijucast right here! Feel free to write me if you have any music requests, are enjoying the podcasts or if you, questions or even ideas for future shows, too – also don’t forget to follow the Kaijucast on Twitter or become a fan on Facebook.